« Am I being mean? Or observant? Not only is this a picture of Lloyd’s replacement Pete Mackanin LAUGHING . . . he’s doing it while sitting in Lloyd’s old office. 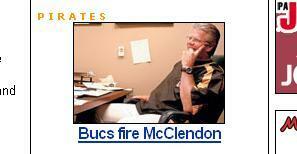 Do you think they could have picked a different picture for that headline? Maybe ol` lloyd can buy THIS picture framed for hanging on his wall.